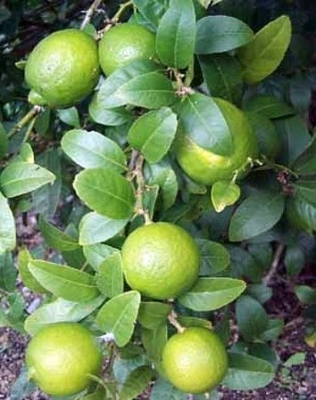 Persian limes are also known as Tahiti limes. This variety has unknown origins but is suspected to be a hybrid of the Mexican lime and citron, a huge, yellow-green, lumpy lemon. Botanists believe this variety was introduced to the Mediterranean area via Persia (now known as Iran). It was carried to Brazil by Portuguese traders, and eventually made it to California in the latter half of the 1800s. Today, Florida is the largest grower of Persian limes, producing 90 percent of the U.S. crop, most of which is used for making fresh juice and canned or frozen juice concentrate. The Persian lime tree has no thorns and produces thicker-skinned fruit larger than the Key lime which keeps longer. These good traits make it a preferable commercial crop. The fruit is oval-shaped, about the same size as a lemon, with a vivid green peel which turns yellow when ripe. The Persian lime is the variety most commonly found in grocery stores. It is usually seedless, and has light-green to yellow pulp which is tender and acidic, yet lacking the distinctive bouquet of the Key lime. It can be used interchangably for the same purposes as Key limes and lemons, and is often used as a substitute for vinegar. Lime juice may be used to clean lime deposits from the interiors of coffee pots and tea kettles. Homeopathically, lime juice has also been used effectively to relieve the effects of stinging coral. Size shipped: Growing in 8" pot, about 12-14" tall. Fruiting size. We cannot ship citrus to; American Samoa, Arizona, California, Florida, Guam, Hawaii, Lousiana, Northern Mariana Islands, Puerto Rico, Texas, Virgin Islands as per USDA Regulations.